Vaillante Sports Angers and TTSC UMMC have secured advantage in the first leg of the 2018/19 TTCLM quarter-finals, playing their matches away. French club beat SPG Walters Wels 3:0, while Russian team overcame Post SV Muhlhausen 3:2. Angers is very close to the biggest achievement in its history as they never played TTCLM semi-finals before. Jens LUDQVIST beat Deni KOZUL in four games of the opener, while other two games have been decided in straight sets: Joao GERALDO prevailed against Adam SZUDI, and Andrea LANDRIEU defeated Dominique PLATTNER. The 2012 TTCLM runner-up UMMC was successful in Muhlhausen, thanks to Andrej GACINA who won both his encounters, against Daniel HABESOHN and Lubomir JANCARIK. Chinese player in Russian team, FANG Bo, former world Top 10 player, defeated JANCARIK but lost to HABESOHN in the very exciting fourth clash (Austrian reversed the score in late third game from 8-10 to 12-10). 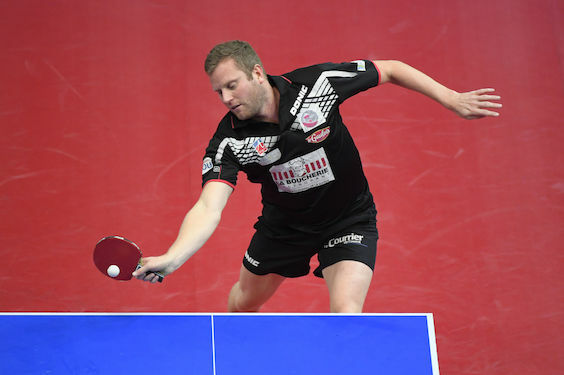 Actual 2018 ITTF European Championships runner-up Ovidiu IONESCU prevailed against 2018 Europe Top 16 Cup bronze medallist Jonathan GROTH after full five games.